£30 off when you spend £100! 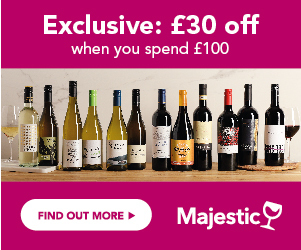 New and Exclusive voucher from Majestic Wine! ...NOW at Tesco Groceries. Hurry, ends soon! ... on your first order at Laithwaites Free delivery on 18+ bottles. Join Beer52 today and receive 8 beers completely FREE! The WinesDirect team are pleased to present you with some of the best wine and Champagne deals you can find on the web... so sit back, relax and enjoy our choice of amazing offers. We have negotiated direct with our wine merchants to bring you some exclusive wine voucher codes and invitations to their wine clubs. Our merchants are a measured mix of the main UK wine merchants, supermarkets and many smaller merchants specialising in wines from specific regions or countries. You can use our wine search where we have created a list of 1000s of Wines and Champagne from our leading Wine Merchant partners, and we've attached relevant vouchers, order requirement and delivery charges to help you understand how each wine merchant operates. If you have never purchased wine online before, visit our wine notes section for information, and offers on white wine, red wine and champagne. You can search our wine guide for wines from your favourite wine regions, or made from your favourite grape varietal and see what offers we have available. If you think we can do better, give us your feedback and we'll try our best to help. Did you know - Wines Direct is tracking over £33,000 worth of discounts on wine.